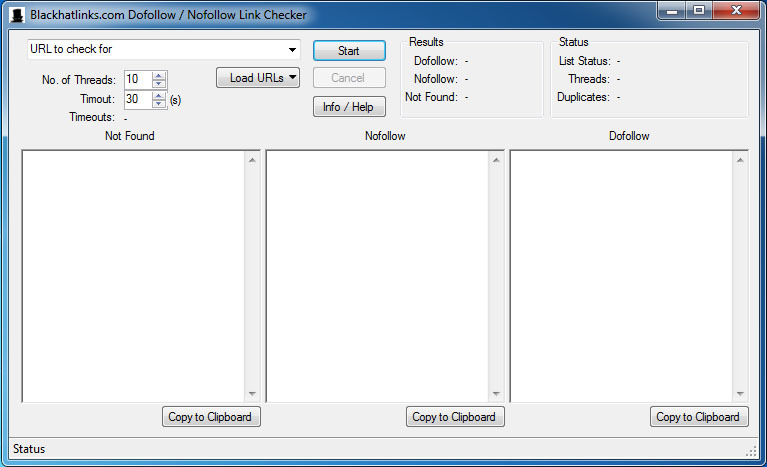 We are proud to release the Blackhatlinks.com Dofollow / Nofollow Link Checker to the public. Now you can check your URLs if your link is set and if it has a nofollow or dofollow attribute. Load your URLs where your link was placed. Load URLs - Load a txt file with your urls. One Url per line. Load URLs Multi Mode -Load your urls and posted sites. One "url/posted site" per line. Put your "URL to check for" into the field. This is the url that the checker should look for.